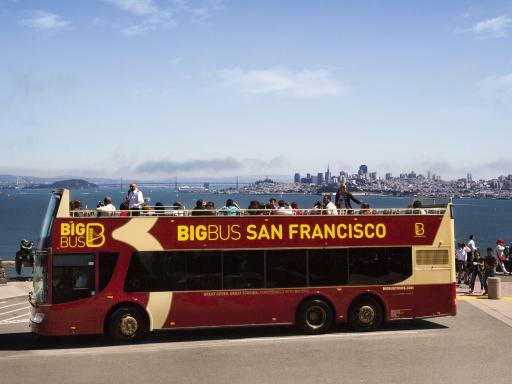 From the comfort of this double-decker bus, enjoy views of this unique city including the Golden Gate Bridge, Fisherman’s Wharf and the iconic “painted ladies” overlooking Alamo Square. An informative guide will point out these landmarks and share with you the unique history of each with you. 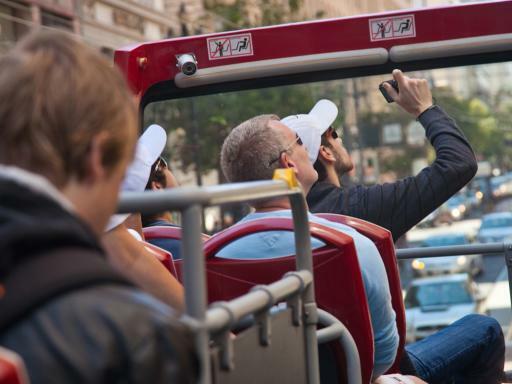 Experience the diverse culture, beautiful parks and stunning architecture at your own pace and with the ability to leave and re-join the open top bus as many times as you like within the validity of your ticket. 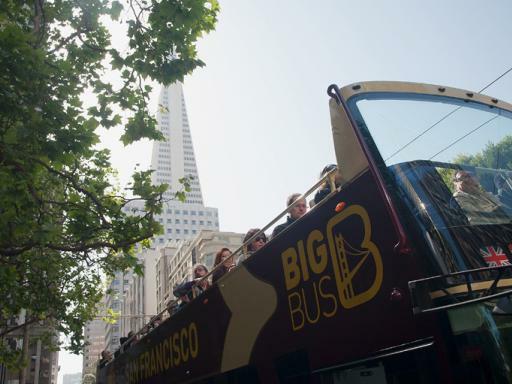 Classic: 1-Day Hop-on, Hop-off tour with over 20 stops allowing you to discover the most iconic sights of San Francisco, and four free walking tours through the city's most famous areas. 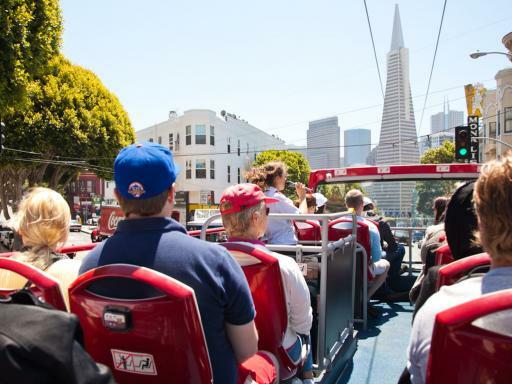 Deluxe: A 2-Day Hop on, Hop off Tour including the four walking tours PLUS a bonus Sausalito Tour AND the Panoramic Night Tour. 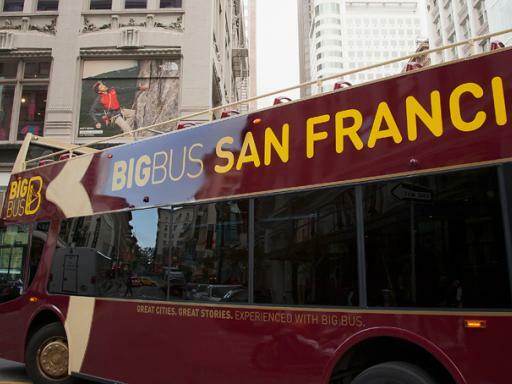 Night Tour: 1.5hour Panoramic Night Tour beginning at Fisherman's Wharf and taking you through Union Street to the Presidio for spectacular views of the Golden Gate Bridge, before climbing historic Nob Hill for a magnificent close up of Grace Cathedral. 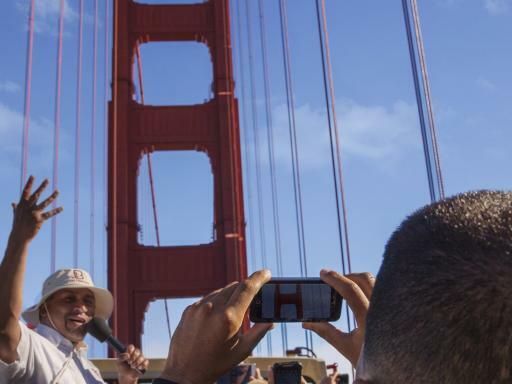 The tour then makes its way across the Bay Bridge to Treasure Island for picturesque views of the city skyline. Back in the city, the tour concludes along the Embarcadero for stunning views of the glittering lights on the Port of San Francisco. Your ticket includes a courtesy shuttle back to Union Square. Fisherman’s Wharf - North Beach - Financial District - Union Square - Hilton Hotel - Asian Art Museum - Opera House - Alamo Square - Haight/Ashbury - California Academy of Sciences- South Vista Point - North Vista Point - Palace of Fine Arts - Lombard Street - Union Square - Chinatown - Ferry Building - Pier 39. Chinatown Walking Tour - Visit this world famous historic neighbourhood and see the busy marketplace, the famous Chinatown gates and experience the mix of historical and modern day culture. Your guide will take you to the best places for Chinese tea, Dim Sum and to a fascinating fortune cookie factory. Duration is 1.5 hours and there are daily departures from Stop 5 at 10.30am, 12.30pm and 2.30pm. The tour ends at Stop 4. 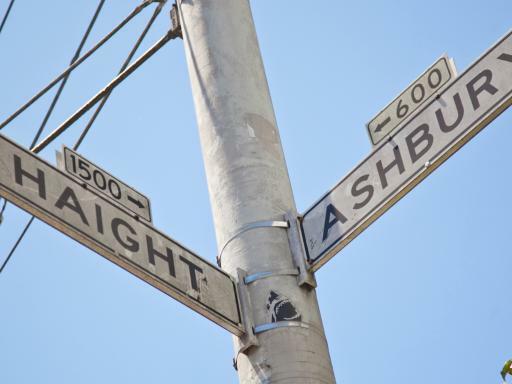 North Beach Walking Tour - This tour takes you on a journey through the eclectic Little Italy district. Visit Washington Square Park and St.Peter & Paul Church. Duration is 1 hour and there are daily departures from Stop 3 at 11.00am and 3.00pm. The tour also ends at Stop 3. Barbary Coast Walking Tour - This walking tour takes you through a nine block radius of San Francisco where you will hear of San Francisco’s small beginnings to its boom-town growth because of the California Gold Rush. The walk will take you through the Financial District and Jackson Square Historic District. Duration is 1 hour and there are daily departures from Stop 5 at 12.00pm and 4.00pm. Tour ends at Stop 4. 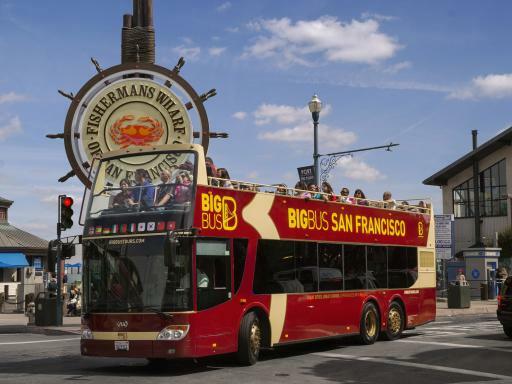 Fisherman's Wharf Walk - Take a trip to one of the most highly visited spots in San Francisco to see Ghirardelli Square, home of the legendary chocolate maker, the world famous San Francisco cable car, and get a behind-the-scenes look into how Fisherman’s Wharf really operates. Duration is 1 hour and there are daily departures from Stop 1 at 2.00pm. Free bike rental (1 free hour of bike rental when you buy a 1-hour bike rental): Explore San Francisco by bike with a complimentary 1-hour bike rental. Available from any Blazing Saddles shop, the team will equip you with all the necessary gear and explain how to make the most of cycling in the city. 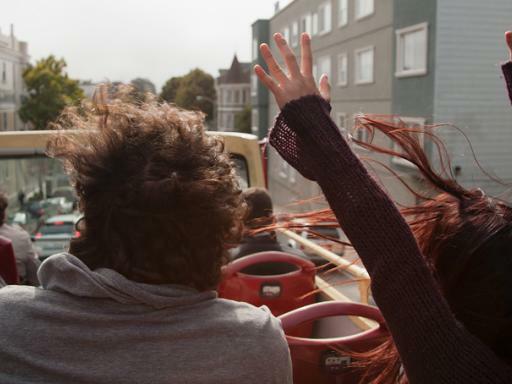 Panoramic Open Top Night Tour: This 1.5-hour panoramic night tour of San Francisco includes a courtesy shuttle to Union Square at the end of the tour. Highlights include the Golden Gate Bridge, Grace Cathedral, Bay Bridge and skyline views from Treasure Island. Sausalito Trolley Tour: Hop-on, Hop-off sightseeing tour of Sausalito. With 5 stops, see the best sights of Sausalito with a minimum of fuss. Discover distinctive boutiques, a wide selection of restaurants and cafes and unique art galleries. Dine with spectacular views of the bay, relax in the park, or explore the narrow streets in the hills of this quaint Mediterranean town. Your voucher is open-dated but must be used within 6 months after the purchase date. You can use your ticket on any date. If you purchase a 2-Day ticket you must travel on consecutive days. 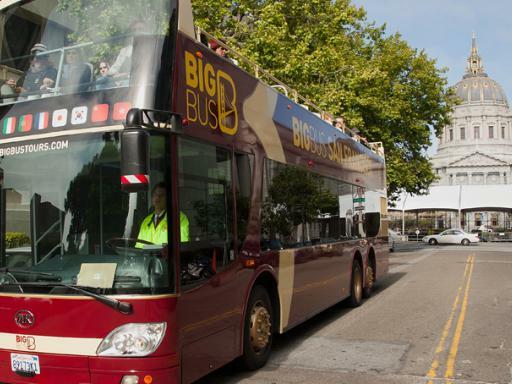 Big Bus Tours reserves the right to deviate from the route of a service where reasonably prudent to do so in the light of circumstances beyond the company’s control. Children aged 4 years and under may travel free of charge. Children aged 15 years and under must be accompanied by an adult. Strollers and pushchairs must be folded and stowed on the lower deck. No pets are allowed on board the bus, except ADA service animals. No food or alcohol is permitted on board the bus. Non-alcoholic drinks in screw-top bottles are permitted. 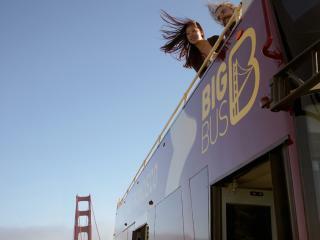 Blazing Saddles offers Big Bus Tours customers 1 hour free with the purchase of a 1-hour bike rental. The first bus departs at 9.00am from Fisherman's Wharf and run at regular intervals (every 10 - 20 minutes depending on the time of year). A child ticket is available for children aged between 5 and 15 years. Children must be accompanied by an adult. Children aged under 4 may travel free of charge if accompanied by a dedicated adult.